Hooking up smart gadgets around your home ensures it’s clean, secure, efficient and just downright easier to live in. So what’s the best smart tech you can use in your living room? This is a beginner’s guide, but all of the tech here has been included as it’s affordable and could make a genuine difference to the way you live your life. Below, TechRadar's James Peckham breaks down five of his favourite devices you’ll need to have to fully create a smart living room that will change the way you relax at home. Check out James' whole house smart tech list, too. Find all of our smart home technology on our dedicated hub page, too. A smart speaker is the hub of any good smart home, but here we’ve chosen one you may not have heard of before. Choices like the Amazon Echo, Google Home or Apple HomePod all offer a useful experience to control your smart home – as well as offering unique smart features – but the Sonos One offers the best bang for your buck if you want top audio quality speaker with smart functionality built-in too. 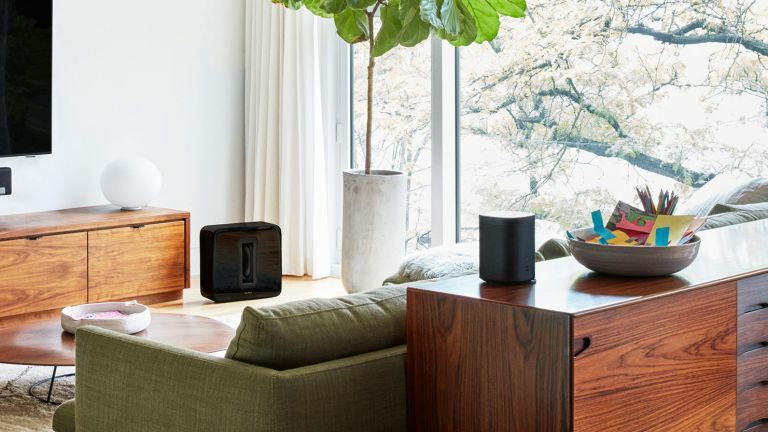 The Sonos One is a wireless speaker which you can connect to through Bluetooth to play music, podcasts or audiobooks from your favourite streaming apps, but it also has Amazon Alexa built-in. That’s the smart assistant that is usually available on the Amazon Echo, and it means you have access to all of the other features Alexa offers. Sonos has refined the audio quality here so it’s a good speaker at the same time for listening to music, but you can also use this to control your gadgets in your home as well as decide what music you want to play. Use our guide to the best smart speakers to find a whole load more buys (and buying advice). Want all your main lighting in your home to be controlled with your voice? It’s one of the best smart home upgrades you can get, and it works especially well in your living room. For this, we’d recommend the Philips Hue set up, which again also works with Amazon Alexa and all the other big name voice assistants. Picking up the Philips Hue Starter Kit (read our review) will supply you with the basics you need to change your lighting in your living room into a smart set-up with a hub for the tech to work from and a selection of four bulbs to use too. Need more than four? You can buy a variety of extras that add into the set too. Once you’re all set up, you can ask your smart speaker to turn the lights on or off, and it’ll instantly happen so you don’t need to get up and press a switch. Perhaps the most useful part of it is you can change the level of lighting in your living room. If you’re watching a movie, you can turn the lighting down or even ask for a specific colour to help you relax into what you’re watching and set the perfect mood. You can even use some third-party apps so the lighting changes to your music, movies and games you're playing at the time. Use our guide to the best smart lighting gadgets to get the full low-down on the kit you should buy. Find the best smart lightbulbs for your lighting gadgets, too. A smart plug is one of the easiest and most affordable ways to make your home that touch more intelligent. We recommend the D Link smart plug, which works with Amazon Alexa and Google Assistant. You’ll be able to plug any appliance into it and use it like a normal plug. You can then control whatever the gadget is with the mydlink Home App or through a smart speaker. You’ll be able to monitor how much energy it uses, but the most useful thing it does is turn your gadget on and off. It basically means you can make a lamp into a smart light, turn a heater on before you get home or set your fan going a few moments before you arrive to cool down your space. You can pretty much use this for anything; you could even plug in your Christmas lights and control them from far away. You could go out and buy a brand new smart TV for a small fortune, or you could grab a Google Chromecast Ultra that can plug into your existing set-up and bring all of the features of a smart TV for an affordable price. If you don’t already have smart apps like Netflix or YouTube on your TV, picking up a Google Chromecast will allow you to stream almost anything you want directly from your phone to your TV. All you have to do is plug this into your HDMI port on the back or side of your TV and connect it up to your home internet. There is a variety of third-party apps that have Google Chromecast support so you can then stream TV, movies, music and more directly from your phone up to your TV with ease. Want to watch the latest episode of that BBC iPlayer drama you’ve been bingeing? You can do that from your phone or tablet with a Chromecast Ultra. Plus if you have a 4K TV, the Google Chromecast Ultra will be able to stream compatible TV shows and movies in that quality too. You’ll need some very strong internet to get all of the benefits of this, but it’s possible and one of the best ways to watch TV online in the best quality possible. Use our guide to the best smart streaming devices to find the best system for you.